Ripple Effect | Arts and Culture | Style Weekly - Richmond, VA local news, arts, and events. 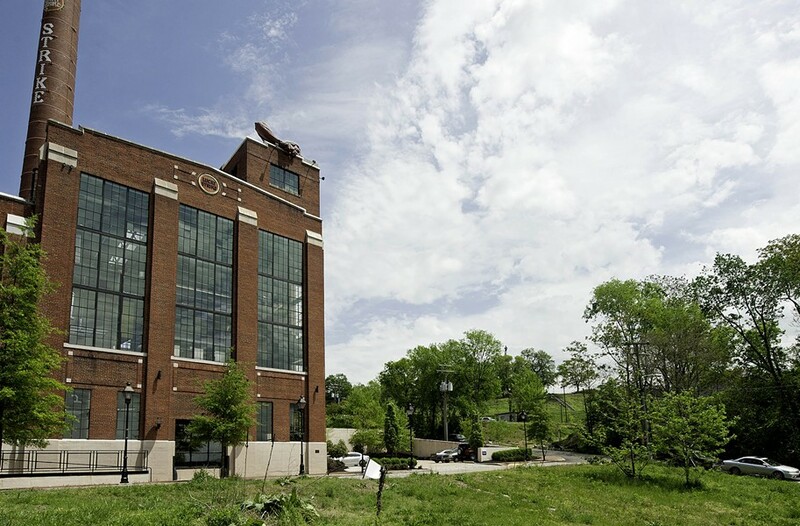 The high-rise Libby Hill condominium threatens to disrupt the urban landscape and should be relocated. Scott Elmquist The sculpture, “Connecticut,” peers over the Lucky Strike building near East Cary and Pear. But soon the naturla views may be obscured. Richmond's civic esteem is on the upswing with the city basking in national media attention. It's a dining destination, boasts a celebrated wild river and is highly tattooed. You sense that while the brain drain of the young slows and the migration of empty nesters accelerates, the population is growing for the first time in decades. Much of Richmond's overall appeal is its distinctive and dramatic topography with a river running through it. Despite the plethora of railroad trestles, interstates and factories that long obscured the James, residents have reconnected with the waterway, especially through the well-planned James River Park System, Brown's Island and Canal Walk. Many of Richmond's neighborhoods were established along the James for both the vistas and the breezes. By the mid-20th century, when many American cities such as Norfolk embraced urban removal as a redevelopment tool, Richmond mostly resisted the approach. (Sadly, Manchester and Fulton Bottom were exceptions.) So if Richmond's neighborhoods were well-worn, they remained largely intact by the late 20th century. The result was an impressive stock of houses, warehouses, schools and even old churches, giving Richmond a character that few cities could match. Add liberal tax-credit programs and stir. Neighborhood after neighborhood, from Rockett's Landing to Scott's Addition, received some level of historic designation. That's led to Richmond being as pulled-together as it's ever been. The urban design challenge now is how to tweak refinements to the recently refreshed city. How does Richmond enhance, not hinder, the dramatic accomplishments of the past 50 years of urban revitalization, individual and public investment, elbow grease and pride of place? During the past half-century, Richmond and nearby counties have grown to appreciate the James and its natural and built environs in their complexity — the web of riverbanks, tributaries, hills, valleys, parks and surrounding structures that are as much a part of the civic infrastructure as our street grid and well-established neighborhoods. This river-centric infrastructure is an ever-evolving, natural and architectural matrix akin to an ecosystem: If one thing falls out of whack, the ripples adversely affect something else. So an urban landscape as special as Richmond's is highly precious and can lose its unique character in ways not easily detectable. Consider how downtown has lost too many historic views of the river and hillsides because of unwise planning decisions. The Crowne Plaza hotel, at the foot of Sixth and Canal streets, is an unrelenting wall that blocks a southern vista of the James. In Court End, on the Virginia Commonwealth University medical campus, the pedestrian experience has eroded irreconcilably, with institutional buildings brazenly built atop streets and in intersections that once allowed air flow, sunlight and exquisite panoramic views that allowed connectedness. Court End, with an embarrassment of historical and architectural riches including such national historic landmarks as the Egyptian Building, Monumental Church and Wickham House, had the potential to be one of the most distinctive places anywhere — the medical campus included. Instead, the urban grid was so overbuilt that the place is choking on itself. Such projects as the Gateway Building (built in the middle of 11th Street) and a cancer research center (sprawled across Marshall) block former traffic ways and vistas, all but killing the spirit of the place. In Shockoe Bottom, the proposed ballpark, big-box grocery store, hotel and parking deck are unwelcome insults to common sense and clearheaded urban design. Force-feeding such an overscaled project into so historically delicate an environment shows unfathomable shortsightedness. But the Richmond Planning Commission's recent approval of a high-rise condominium project where East Cary Street meets Pear, at the eastern end of Tobacco Row below Libby Hill, is an inexplicable endorsement of hubris and greed. The planned high-rise would irreparably interrupt a defining historical landscape that begins at Shiplock Park — the site of the last remaining working lock in the canal system — and sweeps upward in a series of elegant terraces that define Richmond's oldest public park, Libby Hill. It would block the view of Libby Hill from Cary looking upward and eastward. Currently the hillside is terraced and creates a green amphitheater that's long defined this part of town. After 57 years of painstaking historic preservation in the area — beginning in 1957, when the restoration of Church Hill began — it's sad that in one fell swoop a high-rise, out of context to the site and setting, could be allowed to hog this pivotal space. The argument that's been made, that this building will advance contemporary architecture in Richmond, is ridiculous. I'm a modernist, and trust me: This isn't a work of design that calls for ignoring both the current downtown and riverfront plans. As Paul Goldberger, the architecture critic of the New Yorker, wrote years ago, "To defer to what has come before is frequently correct, and it is almost always a civilized way in which to design."